5 out of 5 based on 1449 ratings. The Rainbow e2 Gold series version Rainbow was manufactured from 2004 through 2008. This was the first version of the two-speed Hurricane motor design. Over the years there have been many improvements and we carry every part. Some reference numbers that you may find on your Rainbow. R11957D is the item number to the main sticker that is on the early version and R13190-0 is on the second version. This decal has the model number as well as voltage information and is located on the bottom of the main housing. Below are images breaking down the complete E2 Type 12 Gold version Rainbow. Click on each area of the system to get a more in-depth view. Effective serial number 1000000 with a start date of September 4th 2003 through serial number 1316999 and an end date of August 2007. This category covers the complete Rainbow e2 Gold cap cover assembly for the sound reduction version that includes the main power switch, handle pad, and side lens. This category covers the complete Rainbow e2 Gold cap cover assembly for the NON-sound reduction version that includes the main power switch, handle pad, and side lens. This category covers the complete Rainbow e2 Gold version 2 main housing that includes the face plate, rear cover assembly, latches, and HEPA filter. 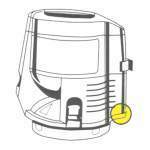 This category covers the complete Rainbow e2 Gold version 1 main housing that includes the face plate, rear cover assembly, latches, and HEPA filter. This category covers the Rainbow e2 Gold controller assembly that is the main circuit board for the complete system. Also includes the main power cord and wire harness. This category covers the Rainbow e2 Gold controller assembly (the main circuit board for the complete system), the main power cord, and wire harness. This category covers the complete face plate assembly for the Rainbow e2 Gold that includes the water pan neck, shroud, and springs. This category covers the complete Rainbow e2 Gold rear cover assembly that includes the exhaust cover, cord caddy ears, and retainers. This category covers the complete Rainbow e2 Gold version two motor / pump assembly that includes the bearings, gaskets, separator, rotor, and stator. This category covers the complete Rainbow e2 Gold version 1 motor / pump assembly that includes the bearings, gaskets, separator, rotor, and stator. This category covers the complete Rainbow e2 Gold standard hose assembly that includes the hose, coupling kit, latches, seals, and screws.